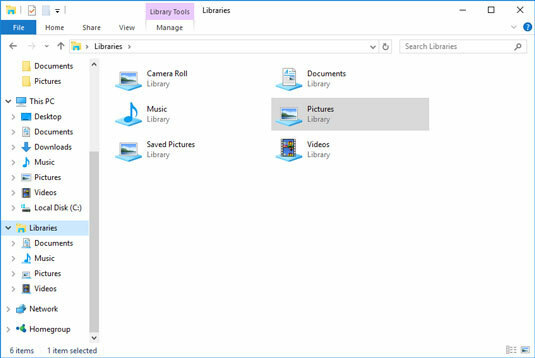 After you’ve set up your libraries in Windows 10, when you start File Explorer and click Libraries on the left, icons for the four libraries that you just built appear, along with two others (Camera Roll, Saved Pictures) that may have been added by the Phone Companion app. The four horses of the library apocalypse. You may be tempted to think that Windows magically identifies the kinds of files you’re working with and shows them in the appropriate library — all your pictures appear in the Pictures library, for example. That isn’t how libraries work. Everything that appears in the Documents library comes from the Documents folder, mashed together with the Public\Documents folder, and the contents of Documents in OneDrive. The same is true for the Music library. Everything in the Pictures library comes from either the Pictures or Public Pictures folder, or from OneDrive. And the same is true for the Videos library. The converse is also true. Every file in the Music folder appears in the Music library, as does every file in the Public\Music folder. Windows doesn’t dig in to the file and see whether it’s a music file. The Music library doesn’t consist of music files, necessarily. It’s just a mash-up of all the files in those two folders. If you want to search all your music for an album by Nickelback, go to the Music library and in the upper-right corner search for Nickelback. If you want to search for documents and spreadsheets that contain the word defenestrate, bring up the Documents library, type defenestrate in the search box, and Windows returns all the documents in both \Documents and \Public\Documents that contain the word. Imagine how that searching can make your life easier if you keep, say, all your music in a folder on one computer that’s attached to your network. Set up your Music library to include that folder, and your searching just got a whole lot easier. If you have a computer with an SD card, or an external hard drive, set up a \Documents folder on the SD card or external hard drive, and add it to your Documents library. That makes it easier to find documents on the SD card, store documents on the SD card, and generally keep your system running much, much easier: You don’t have to think about where the data’s stored because it’s all in the library. When an application running under Windows looks for the Documents folder, Windows hands it the entire Documents library. If you start a graphics program and choose File, Open, you don’t go to your Pictures folder anymore. Instead, you open the Pictures library. Imagine. If you have a folder on another computer that contains documents you commonly use, and you add that folder to your Documents library, every time you crank up Word and choose File, Open, that folder is staring right at you. Unlike earlier versions, Windows Media Player doesn’t need separate settings to handle libraries because Windows takes care of everything. Yes, Microsoft stacks the deck in more recent versions of Office and some other programs — a File, Open takes you to OneDrive. Blech. But few other programs work that way. Think of libraries as Folders: The Next Generation.